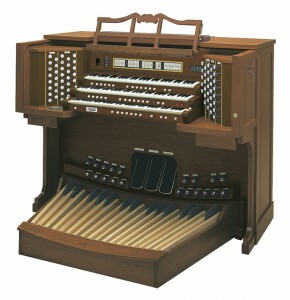 Unlike the piano, most organ music is intended for performance in a legato (“smooth/connected”) style. Selecting appropriate stops (or voices) is critical to your success. 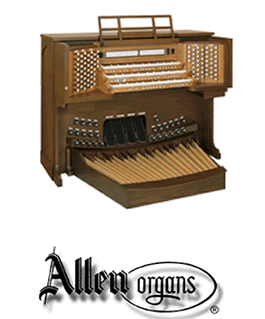 An organist must learn to make judicious use of the swell pedals on an organ. These control the volume of each division of the organ and can be used to great effect in creating the right “feel” of the music being performed. Give careful consideration to the room in which the organ is located. Quite often, a large reverberant room will require fewer stops than a smaller carpeted room. Don’t over-register. Avoid using stops that add little to the overall ensemble. For congregational singing, a good 8’, 4’, 2’ principal chorus along with an 8’, 4’, and 2’ flute combination on swell, and 16’, 8’ and couplers in pedal is a good starting point. In hymn playing, add variety to your playing by varying the registration as verses change. Add an 8’ reed for a verse; add a small mixture for a verse; try using an 8’ reed in the pedal to highlight bass progression; etc. Always remember the most important stop on any organ—the room it is in! Don’t over-register…..use only the stops necessary to provide a confident accompaniment to your choir or congregation. As a general rule, celeste (sharp-tuned) stops and mutation stops should be used with great discretion in accompanying. Provide an introduction to each hymn, most often consisting of first and last line at the same tempo and in the same key in which the hymn will be sung. Vary your registration from hymn to hymn, based on the text. Consider varying your registration from verse to verse. Consider soloing out a tenor line on a prominent reed stop, and octave higher than written. If extra time is needed after the hymn is complete, add a soft improvisation after the last verse to fill the void until the next action in the service. Practice these techniques before using them! Difficult pieces can be made “doable” by practicing right hand, left hand and pedal lines separately at first. Once proficient at each line alone, practice right and left hand together, then right hand and pedal then left hand and pedal, then all three together. For more difficult pieces, consider studying a recorded version of the selection for ideas on registration and dynamic—but don’t be a slave to that version. Don’t forget to practice registration changes, swell pedal changes and piston changes while learning a piece. Leaving these details to learn at the last minute can be disastrous. Always be creative in the practice, preparation and performance of your pieces on the organ. The end result should be a pleasant combination of composer, organ, room and YOU !